The finish is wearing off the farm table. 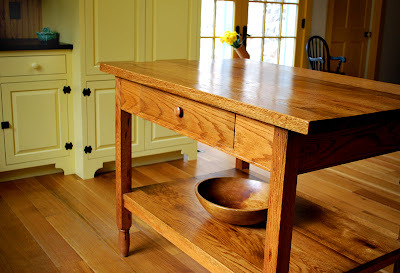 It is one of the messiest places in the house, when covered with cutting boards, vegetable scraps, bread four, mixing bowls, or groceries. Just before breakfast I oiled it. I oiled the antique butter press, too, and found a potholder I had sewn during my first attempts at log cabin patchwork. It felt good to do some sprucing up. 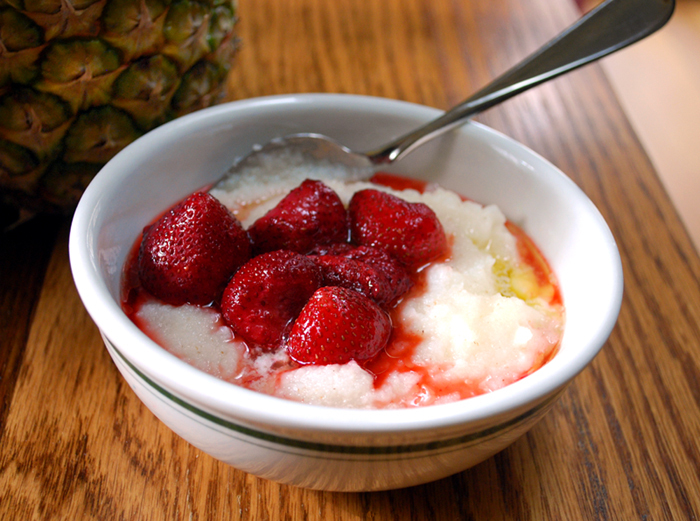 Breakfast was hot cereal. The Man-of-the-House made a smoothie and left a few frozen strawberries behind – thawing in a dish. At an impulse his wife poured them onto a bowl of cereal. Their son appreciated the novelty when it was served to him. I was feeling domestically uplifted. You see, the day before I had turned a few pages in The Hidden Art of Homemaking and that is all it took. On Easter Sunday an older-woman-in-the-Lord went to be with Jesus. This inspiring lady helped to shape my life. I never met her in person but I shed a tear for Edith Schaeffer. Hearing her messages on L’Abri Fellowship tapes and reading some of her writings satisfied a longing. 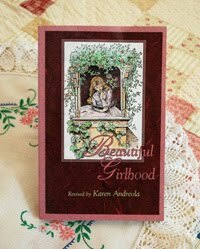 In those early days I longed to know what a dedicated Christian woman looked like – that is - what was important to her, what she thought and felt, how she lived. I sought an example and found one when I made a book friend of Edith Schaeffer. 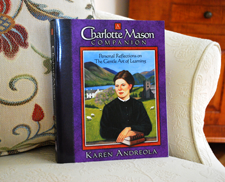 In her writings she describes a myriad of ways to love God, love people, how to serve them and enjoy their company, all-the-while making special the day-to-day aspects of life. 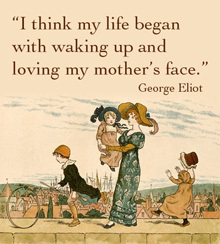 (Hmm, doesn’t this sound something like “the chief end of man?”) Most interesting of all, Edith Schaeffer expressed her personality and her art freely within the realm of family and domesticity. In her book, The Hidden Art of Homemaking Mrs. Schaeffer makes an appeal to the Christian woman who is married or unmarried. She holds fast to the belief that because a Christian is in communication with God the Creator, this should lead to an increased capacity to live creatively. There is no place for humdrum when we are made in our Creator’s image. 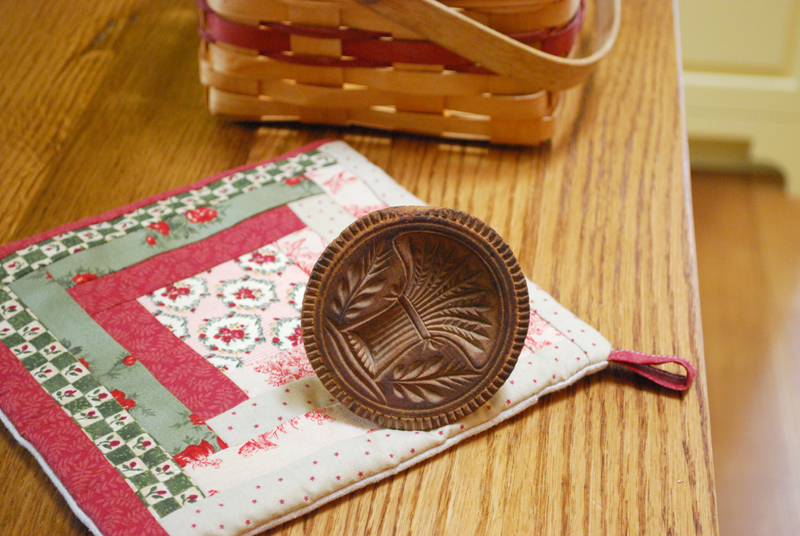 We experience greater fulfillment as women and homemakers when we find and uncover the hidden artist within us. An unmarried young lady, busy wife, exhausted mother, might not feel artistic. Mrs. Schaeffer says we become stoical and inhibited by tucking away the artist within us. Are we safekeeping the effort of artistic expression for a later or a better time? She challenges and persuades us to express ourselves in creative ways now, today, wherever we are living. 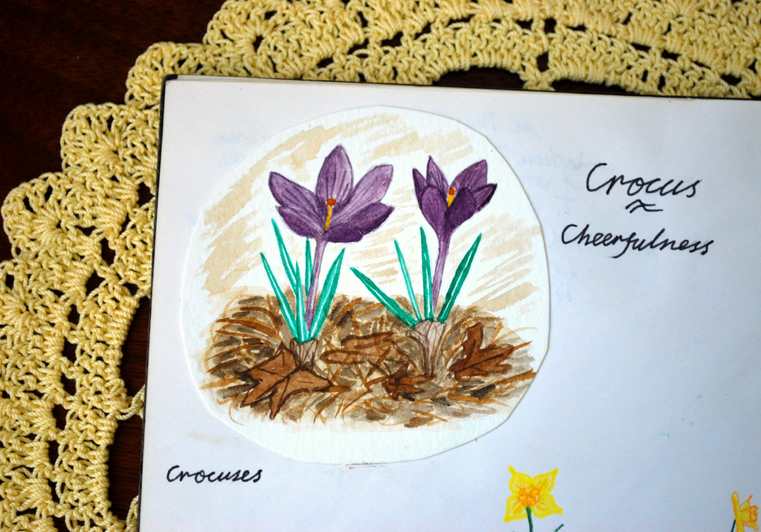 As we grow in the fruits of the Spirit we also have the wonderful freedom to grow in creativity. But we have to step forward and give talent a try. 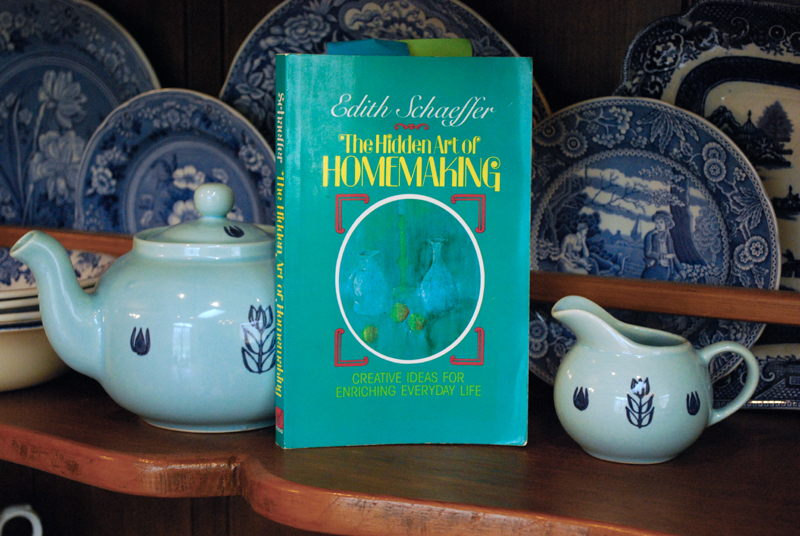 According to Edith Schaeffer it is a solemn responsibility to be a homemaker. 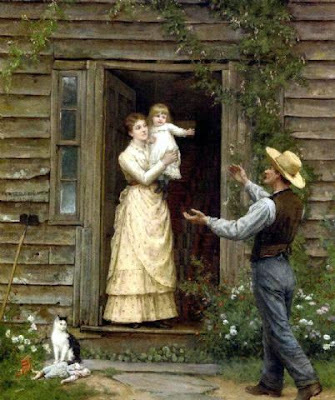 It requires that we develop our personality and use it to minister to our husband, children, and in hospitality. Becoming a Christian, a wife and young mother all within a few short years, I needed someone to open my eyes to the varied opportunities of serving in the home. Edith Schaeffer provided a kindly nudge for me to step forward. In the confusing list of houses our family rented or owned over the years, I took little steps forward. 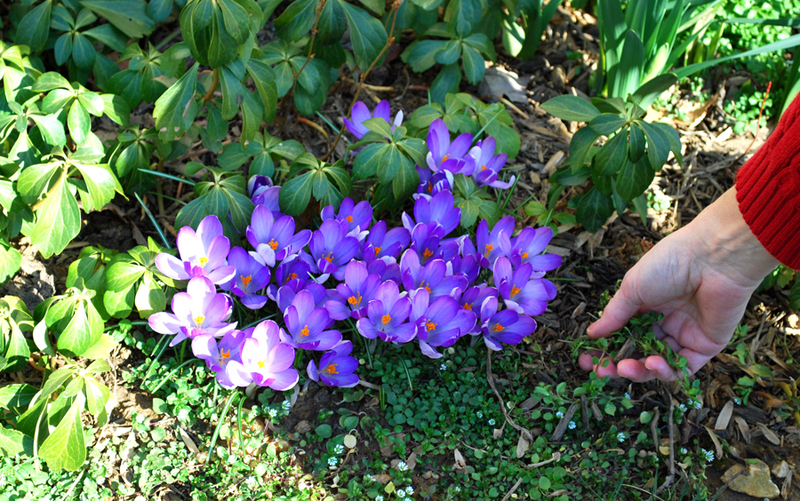 A handful of bulbs, a few annual flowers and herbs were planted in containers. If a patch of sunny ground was available I planted the kind of vegetable - such as zucchini – that an inexperienced gardener doesn’t need a green thumb to harvest. I haven’t any particular knack for flower arrangement but Edith Schaeffer taught me what matters most – flowers are to cheer and to add beauty – so bring them indoors. Recently I stuffed as many apricot daffodils as would fit into an empty spice jar. 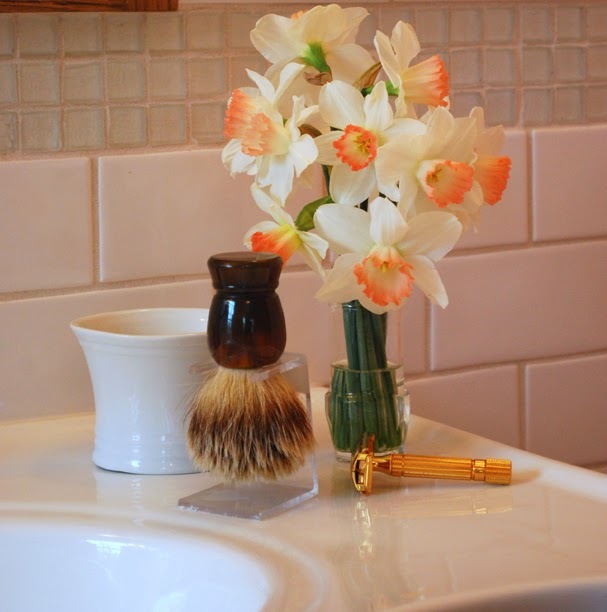 I placed the flowers in a different sort of place - on the bathroom sink for the Man-of-the-House and me. It was indeed cheery. 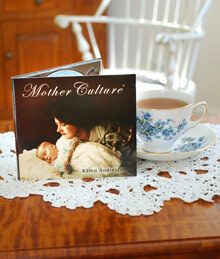 Edith Schaeffer also taught me how to enhance family life and make togetherness enjoyable. 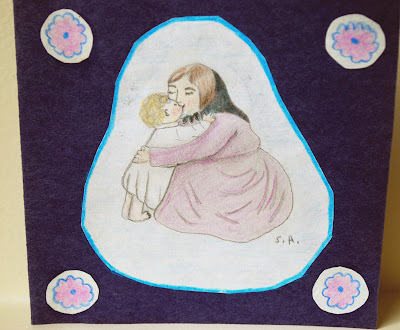 “Happy relationships within a family do not spring up without someone working at it,” she says, “someone who is not putting himself or herself first.” We might not consider this to be homemaking until we read Mrs. Schaeffer’s touching words. 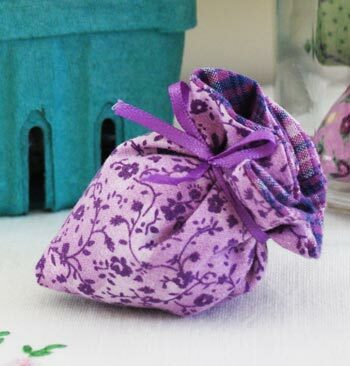 Creating a friendly atmosphere of home is homemaking. It is an atmosphere where unrushed time is taken to build relationships. In her book, examples of drama, music and other creative recreation, provide alternatives (and stand in contrast) to today’s enthralling media choices. 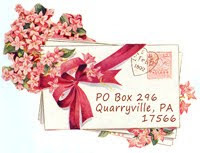 One suggestion is to give handwritten notes. Oh, I liked this idea. 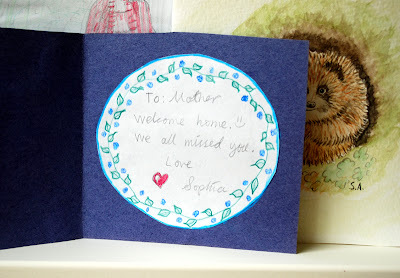 Handwritten notes were affectionately given to my children. In time it caught on. The children began writing notes of their own. Notes can be left on a pillow, secretly slipped into a suitcase, placed among the schoolwork, laid on a dinner plate, or taped to a door. 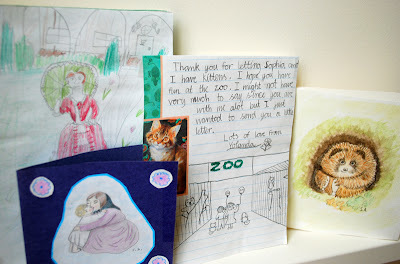 They say, “You are special to me,” while they are saying thank-you, I’m sorry, get well, wonderful performance, good job, I know this was a sad day for you, or I’ll miss you.” What can take the place of a handwritten note in our modern world – especially one with a drawing? I cherish the notes to “Mom” that I’ve saved. “We are citizens of a heavenly country and look forward to a home which is being prepared by God,” says Edith Schaeffer. Meanwhile we can do some creative feathering of our temporary earthly nest. Among her frugal tips for interior decorating, it is her invitation to add comfort and color to an otherwise drab apartment that especially ministered to me when I was feeling drab myself. Although that kitchen had gray-brown carpet and gray-brown cabinets, it wasn’t a drab kitchen. The lovely bright sunshine that poured into it prevented this. The countertop was also unforgettably bright - humorously so – but at the time I wasn’t laughing. It was kumquat orange - an orange akin to Fluorescent - and overpoweringly garish. With Mrs. Schaeffer’s encouragement I made the best of it. Peering through the window of a charity shop I eyed a pitcher. It was cream porcelain with bright old-fashioned orange roses. “It’s got a crack on the handle,” pointed out the Man-of-the-House, who was trying to sympathize with his wife’s “orange problem.” I had my doubts that he was thoroughly convinced it was a significant problem but he put his arm around me and bought it for me, anyway. That Saturday the antique rose pitcher became a dainty addition to the counter top - blending in, and softening the color scheme. On some days it held creamy-white flowers. “What ever happened to that pitcher?” Dean asked me (20 years later) after reading the draft of this post. “Really?” was my curt reply. Has your life been touched by Edith Schaeffer’s ministry? 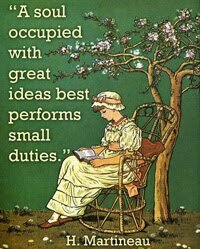 I’d be happy to know if you've also been influenced by The Hidden Art of Homemaking. Are you reserved about leaving a comment? Never mind. 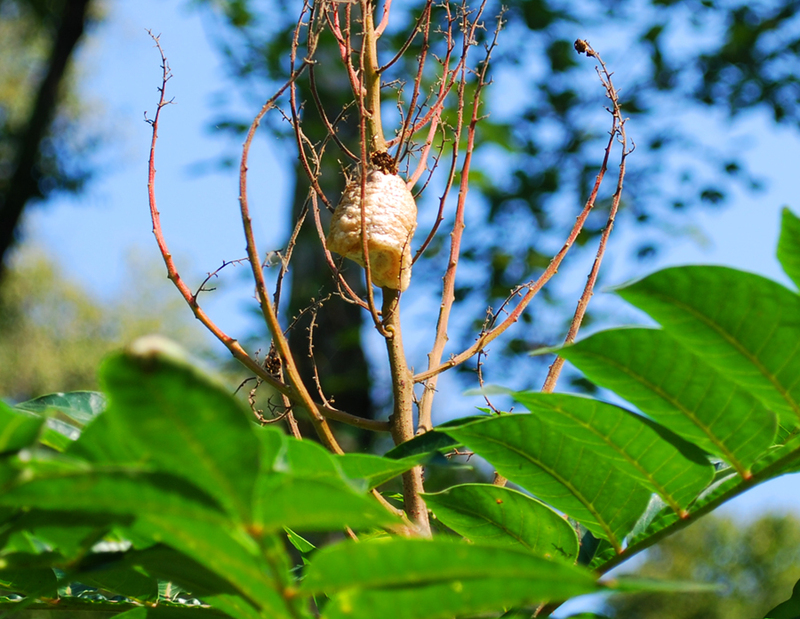 You are cordially welcome to click the inconspicuous word “comments” at the end of the post to read what others may share here – anytime. 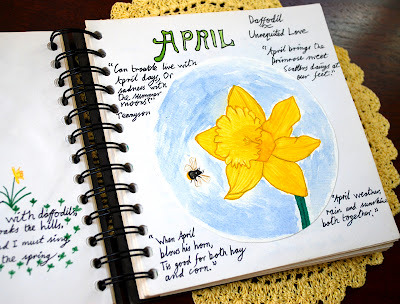 There is a lack of insects in our Nature Notebooks. Yet, here is a bee on Sophia’s page. It is the flowers that get the most attention. But where there are flowers there are insects. Weeding the winter cress out of the front garden I saw that our crocuses were populated with bees when their petals were open to the afternoon sun. I decided it would be wise to weed when the garden was shaded and the petals less populated. 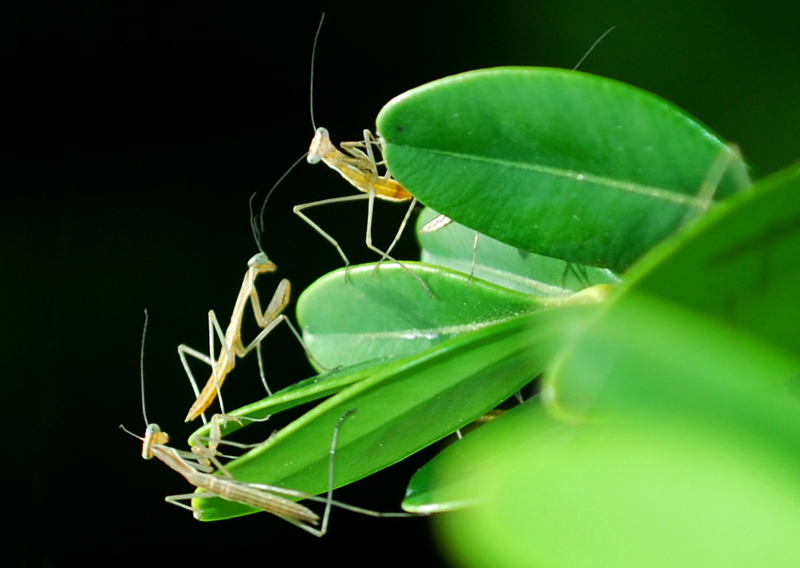 Entomology is a subject in which I have a bias - a bias born of cowardice. I prefer the “nice” insects. It is the nice ones that appear in our Nature Notebooks: the bumblebees, honeybees, ants, butterflies and ladybugs. 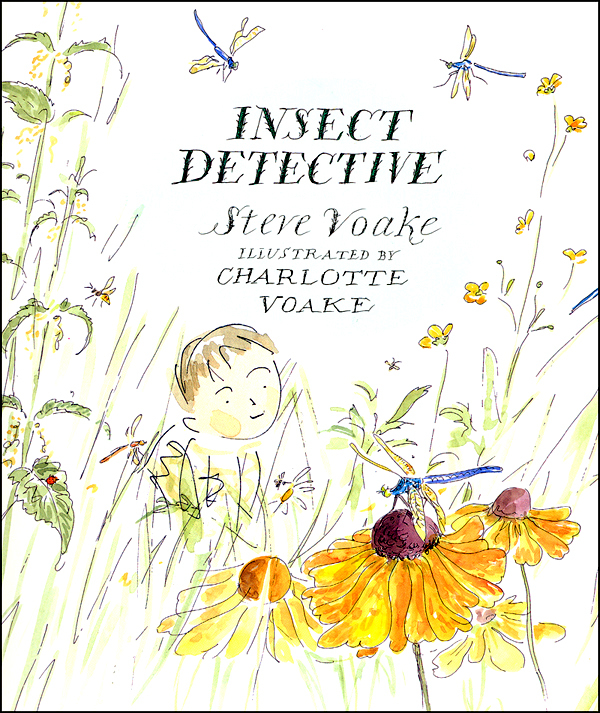 Perhaps we can call them the storybook insects, along with crickets and fireflies. Of these, as well as the less tolerable bugs, my children became familiar. I managed somehow to keep my bias to myself. 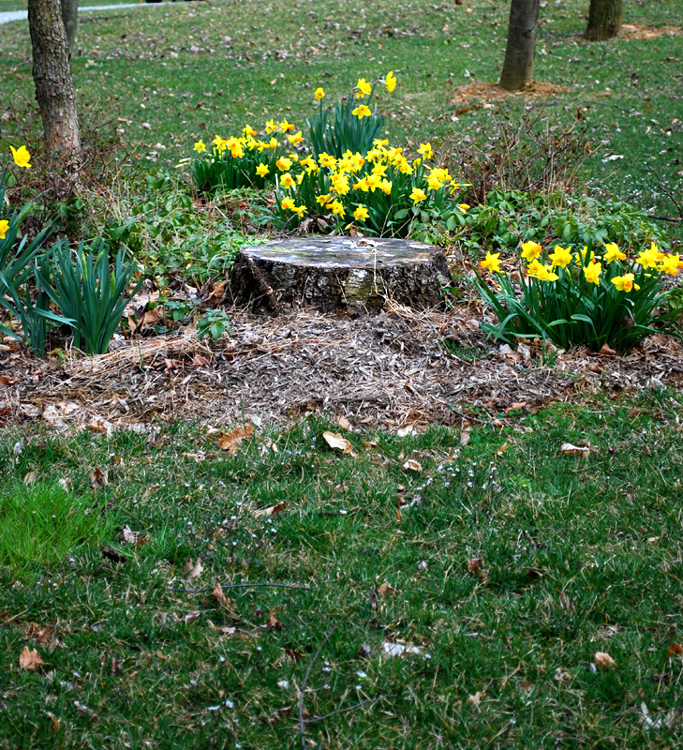 While inspecting our newly blossoming daffodils, the tree stump brought back a memory. In my girlhood I remember sitting on the edge of a rotting tree stump in my neighbor’s front yard waiting for her to come out to play. 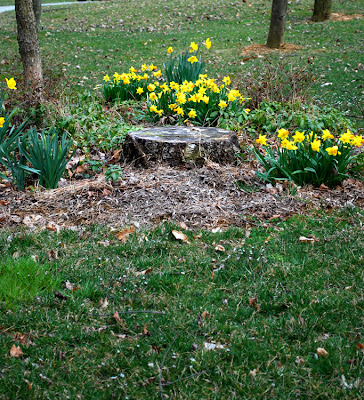 As I waited I gazed into the rotted hole in the middle of the tree stump. It was filled with rainwater. I had excellent eyesight as a child and was startled to see what was taking place in the hole. Little hairy, wiggly worm-like creatures jerked and flitted about in the water. “These must be wigglers,” I thought. In grammar school we drew the life cycle of the mosquito in class. I had never seen a “wiggler” - larva stage - before, but I did now. Bitten enough times by the adult fly I was curious. But I was also creeped-out. I never sat upon that tree stump again. 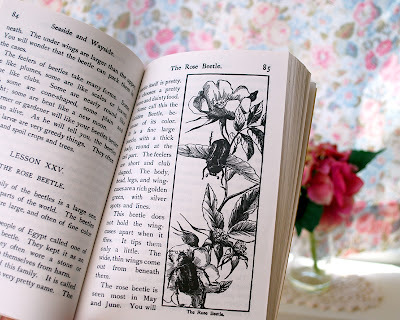 My children and I began our study of insects, along with a selection of other living creatures, with Christian Liberty Nature Reader Book 3 and Book 4 (3rd and 4th grade). 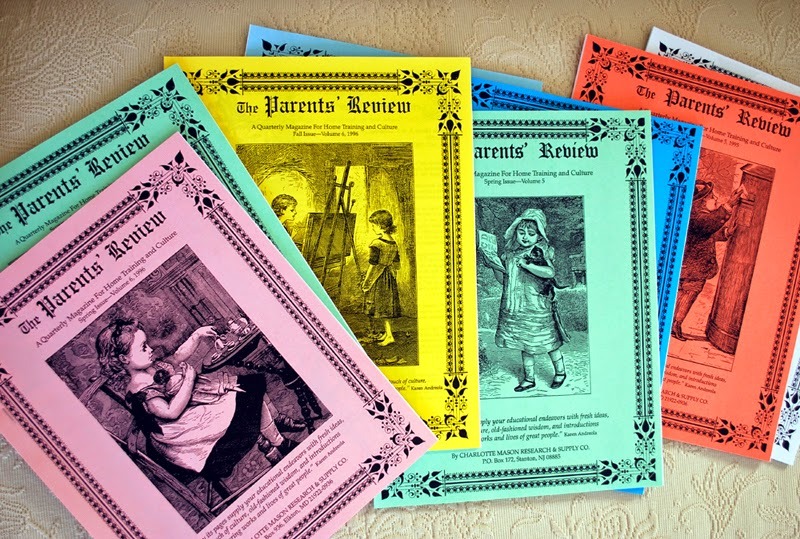 These reprinted Readers were originally meant for children to read themselves, but I recognized the writing style to be the kind that lends itself to enjoyable, attentive listening and thus a narration, too. Therefore I read them aloud. The science facts are presented in a “child-friendly” way. It takes some talent to do this. 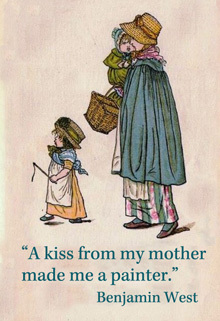 Not every writer has this natural ability that seems to come to those who have a sensitive regard for children. The pen drawings in these age-old Readers are accurate but inadequate at standing on their own. Photographs and modern books can stand in. 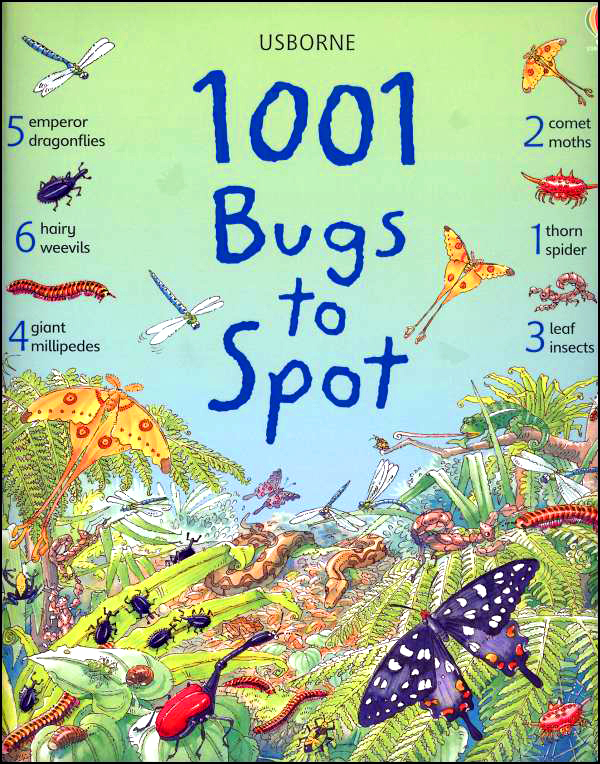 The title 1001Bugs to Spot, sounds ambitious but its colorful array of creepy crawlies are divided into an array of habitats, including that of the garden shed. (Do you know what’s in there?) 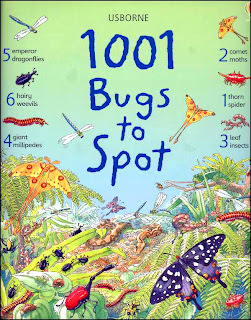 Children will enjoy searching for, and pointing out, the living things on the pages – one day – one habitat - at a time. 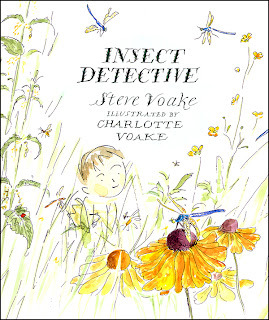 You might like the gentle introduction to insects in the wispy watercolor drawings of Charlotte Voake in, Insect Detective by Steve Voake. Reading this book aloud would help a home teacher like me keep her bias under cover. And yet book-knowledge has only one part to play. The living things on the pages of the Nature Readers, for instance, are what an American child would be likely to bump into; some only in a rural environment, but many could be found in the back yard. Therefore, observing them “in person” (like my mosquito larva) is the ideal. 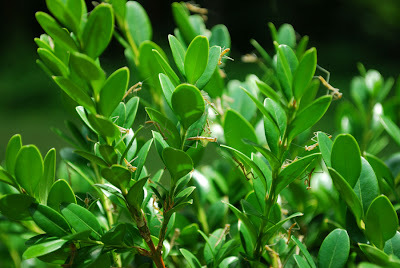 When our family lived in town, surrounded by a little grass with only a few bushes up against the house, I snipped a twig from one of these bushes, placed it in a screened jar, and kept it on the kitchen windowsill. 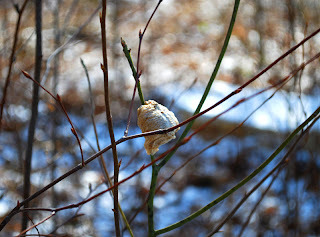 On the twig was a toasted marshmallow-looking ball. I knew it to be a praying mantis egg case. hundred babies. (My entomologist-minded son reminds me that they are nymphs.) We examined the hatchlings . . . 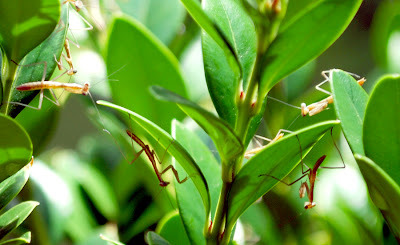 I mean nymphs, closely. 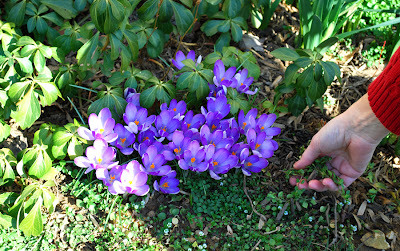 Then I took the jar outside to set them free in the shrubbery. One remained conveniently on the bush at the front door all summer. 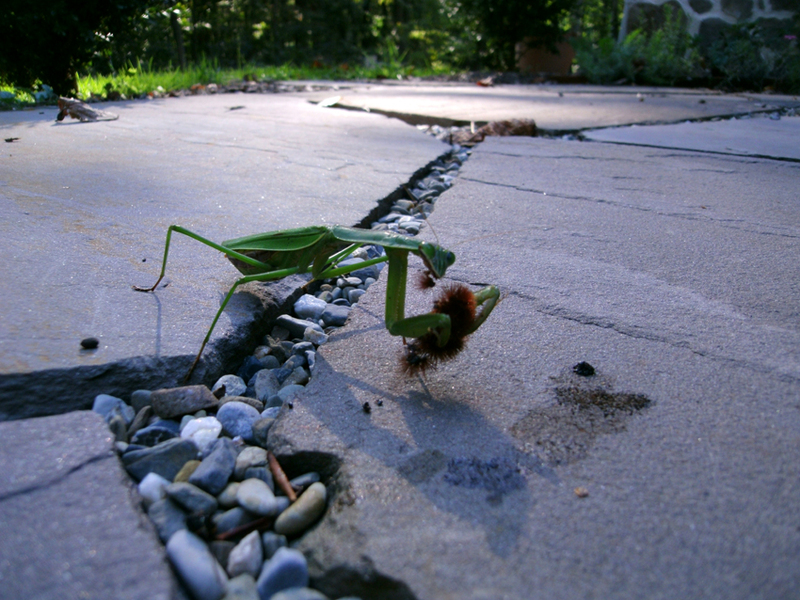 It is the way of these creatures to adopt a territory. Over the course of a year, here in the farmland of Pennsylvania, we photographed our praying mantises. 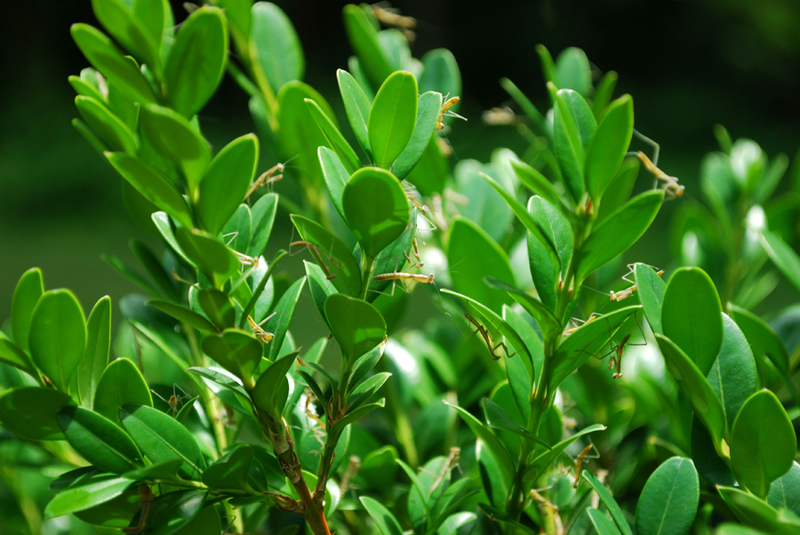 Our first photographs are of the tiny hatchlings in our boxwood. They grew larger and larger, lived among the flowers, and became easier and easier to spot whenever we had the opportunity for a little leisure on the patio. We watched them eat. The photographer had to steady himself on his elbows to take this shot of an evening meal of woolly bear. 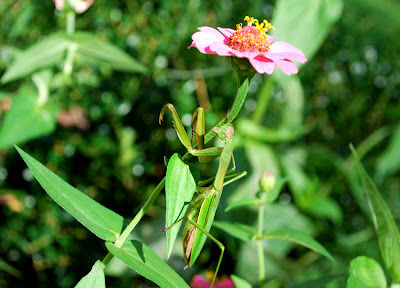 The instant I was told by a bird enthusiast that a large praying mantis could capture a hummingbird I drew in my breath. I’ve spotted these beautiful birds hovering in our zinnia garden where the mantises lie in wait. Together we shuddered at the thought. 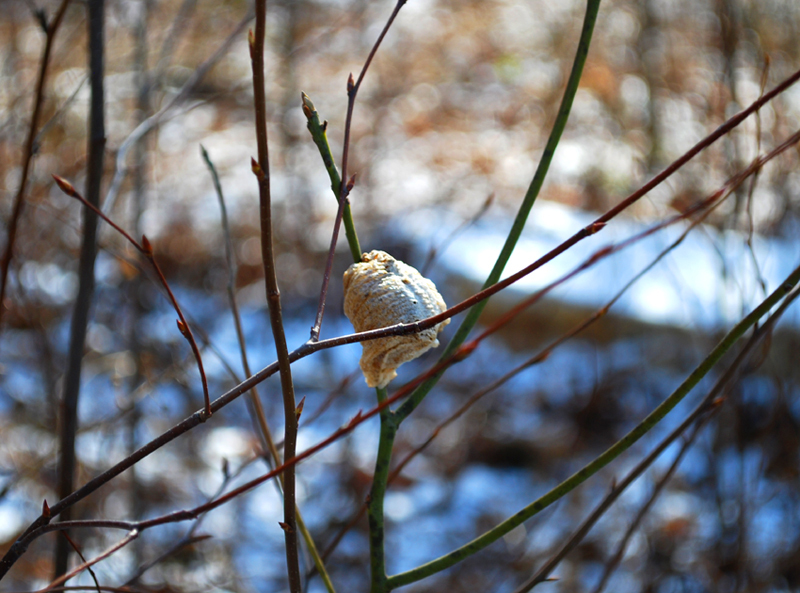 Several toasted marshmallow-looking egg cases have been attached to the branches at the edge of the woods all winter. Mid-May will be another birthday. Thank you Dean and Nigel, for your photography.